The traditional projector is inconvenient for you because of the large size. Projection Distance: 1.2 - 3m. Interface: 3.5mm Audio,HDMI,TF Card Slot,USB. Display type: LCD. ★ LED lamp life is over 30000 hours, ensure your videos will continue to play. Used projector in good working condition. Actual item shown in pictures. Remote and AV cable included. DB Power T20 Mini LCD Projector. Shipped with USPS Priority Mail. Comes with all materials as if brand new. Built-in HiFi Speaker: It is not only just look like a mini speaker, it also has a function of HiFi Speaker for its dual built-in 2W speaker. You can surely enjoy the wonderful audio feast when watching the films. Exquizon LED GP12 Portable Projector 800 480P Support 1080P HDMI USB SD AV Connect. Smart Projector with Excellent Projection Performance. This technology protect your eyes without radiation while still allowing you to enjoy movies, sports, TV. The DBPOWER T2O Projector. By placing the projector at an optimum distance, it will display a clear and bright image. New from an open box. No instructions are included, but they can be found online. DB Power T20 Mini LCD Projector. Condition is Used. Shipped with USPS Priority Mail. Upgraded DBPOWER T20 LCD Mini Movie Multimedia Projector, White. Condition is Used. In excellent shape and working fine. It has been tested and inspected. Includes projector, power adapter, AV cable, HDMI cable, remote and manual. Actual item; comes exactly as shown. Trending at $39.50eBay determines this price through a machine learned model of the product's sale prices within the last 90 days. Tested and they work. These are 1 year old, never sent in warranty. Projection System: LCD technology. PONER SAUND GP9 Projector 1. Why you choose this projector?. 【SUPERIOR WATCHING EXPERIENCE】 2019 upgraded LED lighting provides 60% brightness than ordinary projector. Fit for playing videos, TV series, photos sharing, football matches etc. Projector Type: Video Projector. W hat y ou need is a portable projector. M anual keystone correction and focus efficiently adjust distortion and blurring of image, so that you will have a comfortable visual experience. B esides, it supports full HD 1080P display, you can enjoy the 1080P movies freely. This Mini LED Projector is convenient to carry with a lightweight and portable design. With 3 pieces glass, the projector can show a clear image for you. Multi selection of inputs: HDMI, VGA,USB, AV,SD. This is a single-chip LCD technology projector with 320 240 native pixels, which supports HDTV 1080P resolution video decoding. The projector has two colors (white with blue, white with pink) for you to choose, which looks cute and adorable, popular among kids. 2PCS 22CH FLOUREON Long Range Walkie Talkie Two-Way Radio Set Orange 462-467MHz. Exquizon LED GP12 Portable Projector 800 480P Support 1080P HDMI USB SD AV Connect. 3D TV Glasses&Accessories. Jewellery & Watches & Glasses. Main Features: - Increase multiple ports, including AV, HDMI, SD card, VGA, USB and earphone, directly playing SD card and USB disk files. 3D 1080P HDMI Over RJ45 Cat 6 Cat5e Network Ethernet Converter Splitter Extender. KEYSTONE FUNCTION & PROJECTOR STAND - 15 degree physical correction, adjusts the picture size and orientation more easily than most projectors do. WIDE RANGE OF CONNECTIVITY - HDMI, AV, VGA, SD Card port. 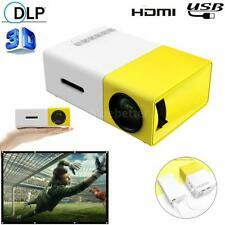 ◆TOP-NOTCH VIEWING EXPERIENCE◆ 50% brighter than ordinary LED projectors, with vivid color and abundant details. Native Resolution: 800 x 480P. 16:9 Wide Screen, Maximum 130" Projection Size. Projection Source: USB/HDMI/AV/SD/VGA. 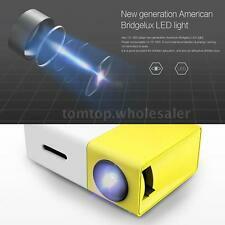 TANGCISON Home Projector Video Projector, LCD Mini Home Projector 150" 1080P. Shipped with USPS Priority Mail. This Mini LED Projector is convenient to carry with a lightweight and portable design. With 3 pieces glass, the projector can show a clear image for you. 3 in 1 Digital LCD Stud Center Finder AC Live Wire Detector Wall Wood Scanner US.